For just about anyone who has seen a straw bale house, it’s obvious that they are different than conventional homes. Some immediately noticeable differences are the thickness and texture of the walls and the overall mass and scale of the house. What is not so apparent are the differences encountered during the construction process. 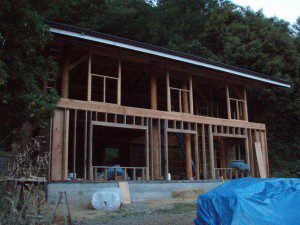 The order of operations for a straw bale house is slightly different from that of a conventional house due to the extra step of filling the walls with bales. How the builder understands and addresses the differences can make or break a job and the timeline that supports it. The first decision that a builder needs to make with regard to a bale house is how the foundation will be handled. Most straw bale homes are built on a slab foundation that is then used as the finish floor. The problem that is presented here is that the finish floor will also be the assembly floor during the construction of the house. This means that for roughly six to nine months, the finish floor will be exposed to many opportunities for damage. The builder needs to consider protecting the floor or pouring the finish slab later in the course of construction. Both have drawbacks. To build the floor later means working over a semi finished space which can create tripping hazards. The installation of an interior slab after the construction of the house is a difficult task to do well in and of itself. Protecting the floors is often the best scenario; however, the builder must be careful that nothing gets underneath the protective materials thus damaging the floor out of sight and unknown to the builder. Another option, the one I use in most cases, is to work with the floor exposed. This means using extreme care and making sure ALL of my subcontractors understand that the surface they are standing on will be the finished floor of the house. I must be sure to inform them of many details including not to write on the floor, attach braces to the floor, use permanent chalk lines, or store any materials on the floor. Final acid staining or other finishes are done at the last minute after all the other subs are gone so the surface can be cleaned and prepped for the perfect finish. Leaving the floor exposed is risky; however, it allows the builder to see the floor at all times and immediately fix any unfavorable conditions. As long as the builder is clear with the subs and trusts them to deliver under the conditions set forth, this is the best way to move forward. What about inspections? Most inspectors want to inspect rough electrical, rough plumbing and rough framing all at the same time. That is not possible in a bale house because the bales need to be in place for the electrical system to be installed. Once the bales are in place, the inspector will not be able to see the framing anymore. 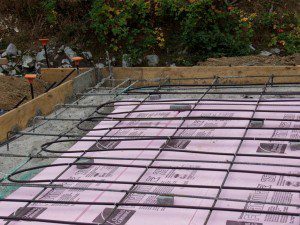 With the slab foundation, the electricians will likely want to install some chases in the floor and run them to interior walls. This is an extra trip for the electrician, so be sure to stay aware of that and other extra trips subs may request. 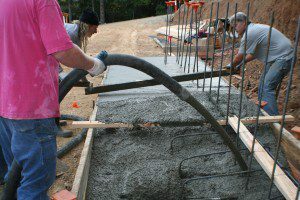 In addition, the inspector may want to approve the locations and quality of the conduit before the concrete is poured. Okay, back to the rough electrical, plumbing and framing inspections. The inspector will have to make two trips. The first will complete the inspection of the framing and the plumbing. Once complete, the builder will need a “sign off” on those two areas leaving the majority of the rough electrical work un-inspected. I say majority because the electricians may install some work prior to the bales; for example, the overhead work in an attic space may be easier to access prior to the bale installation. Once the bales are in place the inspector will return to examine the electrical work. This simple scheduling shift can cause problems if the builder is not clear with the inspector from the beginning on just what he or she will be looking for. Inspectors do not like to waste time so it is important that they be informed ahead of time that the lack of electrical work is intentional during the first inspection. 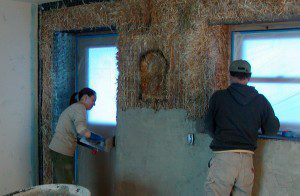 Plastering a bale house takes a long time. The builder will need to pay special attention to this area of the construction because it can easily delay the job for a month or more. Under perfect conditions, the plastering of a home will take at least a month and more likely six weeks. This is because the plaster must sit and cure for a period of time before the next coat can be applied. This promotes “crack out” which is the cracking of the plaster on any particular coat. The plaster should crack out entirely before the next coat is applied so that any cracks in the underlying coat do not telescope into the new coat. In order to avoid cracks in the final coat, adequate time must be given to the scratch and brown coats for proper curing. On conventional homes that use stucco as the exterior finish, the delay does not affect the interior finish process. This is where bale homes differ. 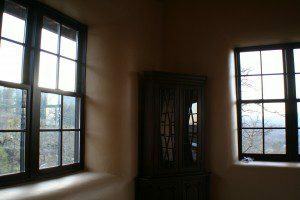 The bales on the interior of the home need to be finished in the same manner as the exterior with three coats of plaster and cure time. That means down time. Tight scheduling and proper protection of other trade’s craftsmanship can speed the job along. During the down time created by the curing process, other trades should be scheduled in the house and the installation of their products completed. Some items will not be possible as the plaster equipment and materials may pose a threat to them; however, many can be installed after the brown coat including tile work, cabinets and countertops. With their installation complete and the materials protected against plaster, the job can continue without delay. These are just a few examples of how scheduling is different on a bale house than a conventional house. There are many other areas of concern that need to be addressed. The point is that a bale house is not a conventional house and this is true before the foundation is even poured. Do not approach a bale house as just another house and don’t let your builder do that either. Be sure that he or she understands the subtleties of building with bales and that he or she is aware of the differences in the construction process. Remember, “time is money” and when some one else is building your house that time and money is yours. Got any tips of your own? Maybe you had similar experiences when building your straw bale house. Keep in mind that the more stories of success and tales of how things could have been better we share with each other, the easier it will be for the next person who builds. Let’s pay it forward. Share your stories in the comments below. This is the one part of bale construction that intrigues me. How will we prevent “crack out” on the build schedule at the workshops? 7 days vs. 6 weeks. Hi Tim. Not an issue because we only apply one coat of the plaster during the workshop. We do the baling, including bale prep and pick up framing as necessary, shaping, electrical and plumbing that is located in the bales, wire mesh, plaster prep, flashing, and scratch coat plastering. That is a FULL 7 days of work to be sure, even with a lot of hands on the job. Once we leave, the hosts have 10 days to allow the scratch coat to cure before applying the brown coat, then another 10 days cure time before the finish coat.